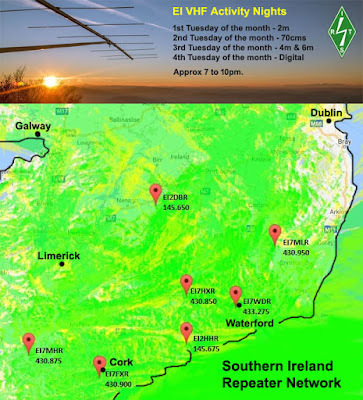 In order to support the EI VHF Activity Nights initiative, we would like to encourage all radio amateurs to make an effort to use the Southern Ireland Repeater Network on the first two Tuesdays of each month. Just access the network via your local repeater and give a call. Also remember that the fourth Tuesday of each month is digital night and you can access the Brandmeister network via our two digital repeaters in Waterford.